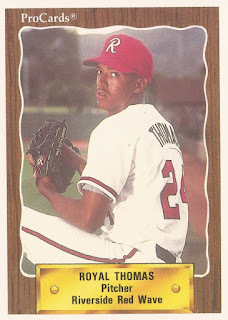 Royal Thomas showed some early durability in the minors for the Phillies in 1989. The starter at single-A Spartanburg went through his first 14 outings and he completed seven of them, according to The Philadelphia Daily News. He went 9-5 in that stretch, with a 3.12 ERA. Thomas went on to show some durability in his career. He went on to play a decade as a pro. He made AAA, but not the majors. Thomas' career started in 1987, taken by the Phillies in the 31st round of the draft out of Westbrook High School in Beaumont, Texas. In Beaumont, Thomas showed some control in summer 1986, playing in the Big League Southern Regional Tournament. He struck out 10 batters in one win. Thomas started with the Phillies at short-season Utica. He went 6-0, with a 1.89 ERA. He moved to Spartanburg and single-A Clearwater for 1988. He went 6-17 overall, but had those seven complete games. Thomas played 1989 back at Clearwater. He then moved to the Padres system and high-A Riverside for 1990. He made AA Wichita in 1992. He went 7-7 there, with a 6.32 ERA over 41 outings, 14 starts. Thomas then moved to the Dodgers system and AA San Antonio for 1993. He arrived with the Braves and AA Greenville for 1994. 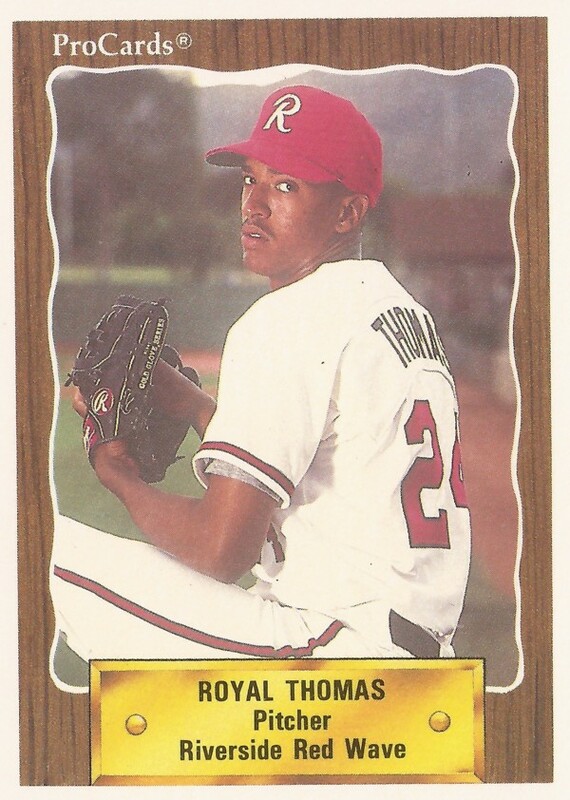 It was the Braves who took Thomas to his only time at AAA. He played in 39 games, starting eight for AAA Richmond in 1995. He went 7-7, with a 3.48 ERA. At one point, he won six consecutive decisions, getting his sixth in relief. His final time in affiliated ball came in 1996 at AA Greenville and at Orlando with the Cubs. He got 10 final starts, with a 6.23 ERA. His final pro time came in 1997 at independent Abiline. He made the league's All-Star team, but compiled a total 6.78 ERA, ending his career.